Then sometimes, I get to cook just for me. Those meals often feature things that make my husband David wrinkle his nose: olives, fish, seafood, chicken livers. One night, years ago, craving a hamburger or pizza or something equally junky, I poked around in the fridge and came up with the junkiest healthy food my imagination could imagine. First, full disclosure: I love iceberg lettuce. I know that is a weird position to hold. Additionally, I love shredded iceberg lettuce when it’s kinda warm and wilty. Double-weird, I know. The salad I cobbled together that night combined elements of a hamburger and an Italian sub. It was not pretty—and I ate it straight out of the mixing bowl—but it was super tasty and enormously satisfying. 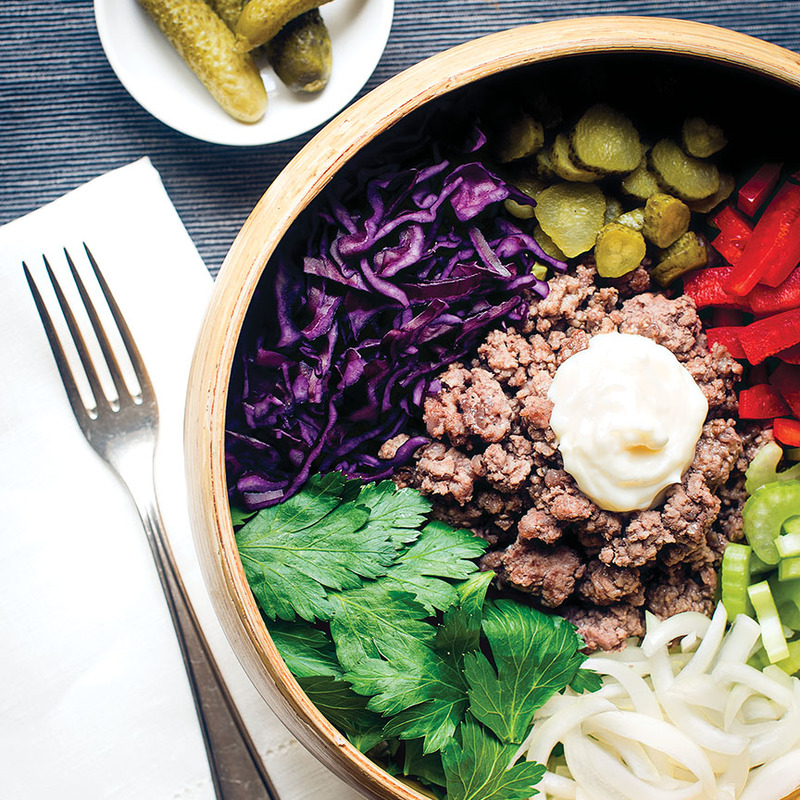 What we now call Hamburger Salad around our house has become a staple because it’s easy to make, it’s crazy-delicious, and it can be customized based on your current mood and what kind of goodies you have in the fridge. The only non-negotiable: homemade mayo. Cook the beef. Heat the oil in a large nonstick skillet over medium-high heat, 3 minutes. While the oil heats, dice the onion. Add the onion to the pan and cook until translucent, 5–7 minutes. Add the beef to the skillet and cook, breaking up the meat with a wooden spoon, until it is just pink, then season with the salt, pep- per, and garlic powder. Cook until browned and set aside, covered, to keep it warm while you prep the rest of the salad. Cut the veggies. Thinly slice all the vegetables, place in a large mixing bowl, and toss with the dressing ingredients. Divide among individual serving bowls or plates. Make the mayo. Place all the mayo ingredients in a pint-size Mason jar and whirl with a stick blender until thickened. To serve, top the salad with the ground beef and place a dollop of mayo on top. Slice the veggies, mix the dressing, and make the mayo; store in separate airtight containers in the fridge. When it’s time to eat, cook the ground beef and assemble the salad. Made a riff on this last night with a hunk of salmon in the middle. Arugula and spinach as the base, with some sliced dill pickles, sliced apple, a scoop of your coleslaw, a scoop of guacamole, and a big dollop of mayo. It was fantastic, thanks (as always) for the inspiration! What a great idea! I sometimes find myself craving the budget and salad combo but unsure of how to recreate it, this does that nicely. Thanks. PS I love iceberg too! We’ve done this ever since we started eating Paleo, except we use a hamburger patty and just put all the burger toppings on the salad. Even my girls have liked it since they were young (I have to put cheese on their burgers though). I always felt like wrapping it in lettuce was too big a bother and messy to eat. I also couldn’t get as many of the yummy things in that I wanted.